Construction has begun on the TriHealth Liberty medical center that’s to open early next year in Butler County’s West Chester Township, and the Business Courier got a peek at both the site and what the completed building will look like. The multimillion-dollar building will encompass 50,000 square feet on 4 acres abutting Cox Road, which is across Interstate 75 from the enormous Liberty Center development. A TriHealth parking lot will accommodate at least 225 vehicles. The roof is to go on in May or June, and some interior work will begin then, said Randy Hammann, TriHealth’s director of ambulatory support services. Construction should wrap up by November, and the center could open by January 2020. TriHealth bought a total of 9 acres from the developer, Miller-Valentine Group, and the building was designed so it can be expanded to 100,000 square feet across the remaining 5 acres. It will anchor a 90-acre mixed-use development by Miller-Valentine. The medical center at 8020 Liberty Way, which is at the corner of Cox Road and Liberty Way, is across the street from Voice of America MetroPark. 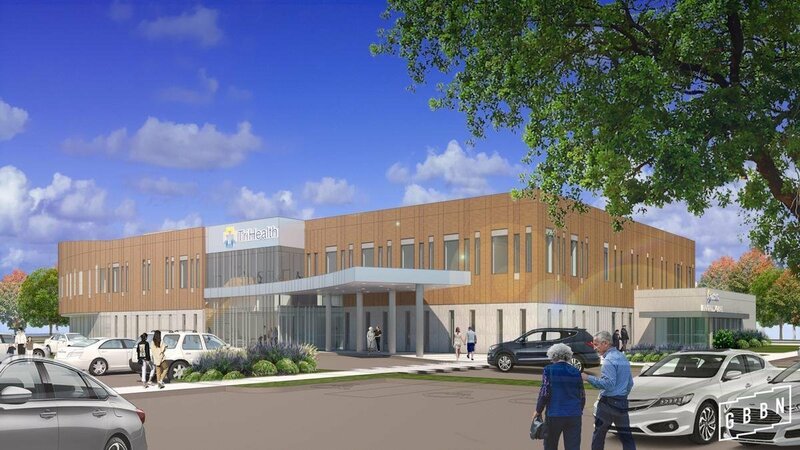 A separate entrance will provide access to an attached urgent care facility, which will be the fourth to fall under the TriHealth Priority Care brand. UC Health’s West Chester Hospital is one mile south of TriHealth Liberty, while Christ Hospital’s medical center in Liberty Township is less than a mile north.Steve Mombach, senior vice president of ambulatory services for TriHealth, noted that both competitors operate emergency departments at those locations, but not an urgent care such as the one planned for TriHealth Liberty. ERs tend to be more expensive for patients. About 70 people will work at TriHealth Liberty, including a dozen new hires. The total will include nine adult primary care doctors, two orthopedic specialists and five specialists in OB/GYN, urogynecology or midwifery. Other services based there will include physical therapy and X-ray. TriHealth Liberty is modeled after TriHealth Kenwood, which involved consolidating physician offices into one location in Hamilton County, Mombach said. He declined to disclose the cost of the Liberty medical center, but the 112,000-square-foot one that opened in Kenwood in 2015 cost $25 million. At TriHealth Liberty, “we’re doing some centralization of some existing practices in the community, trying to put them all under one roof because we’ve seen the synergies that exist are easier for customers and do well together,” Mombach said. “What we’re trying to do is a one-stop shop for the convenience of patients." Mombach declined to specify which physician practices would relocate to TriHealth Liberty but noted that most are smaller doctor offices within a 5-mile radius. TriHealth’s recently expanded Bethesda Butler Hospital is 10 miles west in Hamilton, while a 49,000-square-foot Group Health West Chester physician office building is 6 miles to the west. “So there are a lot of synergies for us in the region, and this will provide a couple of new services that we’re really excited about because we feel it meets a need in the community,” Mombach said. To view a Miller-Valentine aerial video of ongoing construction, click here.